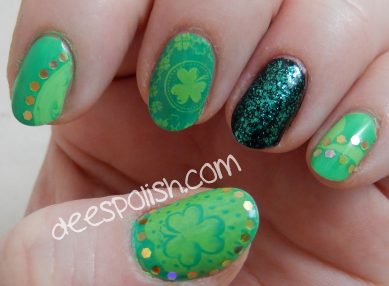 Just thought I would do a quick post for today.. being that it is St. Patrick's Day. This day is rad for many reasons, but two that I especially like are: it is one of my best pal's birthday, and this day has a parade of green - and green (all shades) is my favourite colour. Tiffany, from Nail Polish Canada, was kind enough to send me an image plate for this particular day - so I figured I would put it to good use as two of the images I quite liked! The image plate is BM-H05. Does anyone notice my weak attempt at water marbling? I tossed some gold glitters on there to try to mask it a bit.. which looks rad. In hindsight, I should have gone with a more vibrant green glitter, or just have done a gold accent nails - but I still quite like the whole thing overall. Have a gnarly St. Patty's Day -- see you all again soon! !